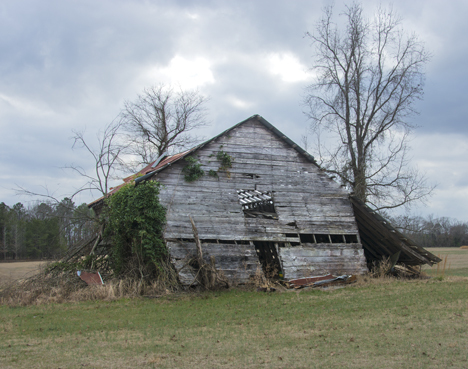 I have seen this old barn so much, it is tattooed in my memory bank. Even so, I did some serious foot-dragging before I finally got it squarely in my view finder. The lean is real. I leveled the camera which eliminates vertical distortion. Gravity will win this fight. Get more looks at the old barn below. It was convenience and a crying need for about a dozen pictures or so shot at a nearby source that finally pushed me over the edge to get off my duff and shoot this location. 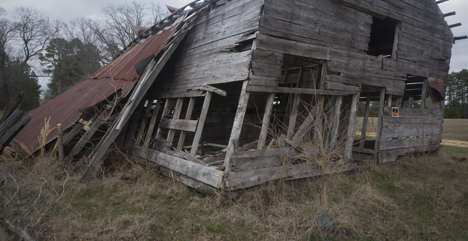 It was ripe with an old car (1950 Chevy), an old tractor, and a precariously leaning barn. For a person who enjoys photographing relics which have seen better days, it is a honey hole. Despite this strong appeal to my baser nature, I have driven past this location on a regular basis for pushing 14 years. I finally figured out the underlying reason for this callous disregard which I freely discuss on the Photo of the Week page at Corndancer dot-com. It is, I suppose, a character defect. Imagine that. 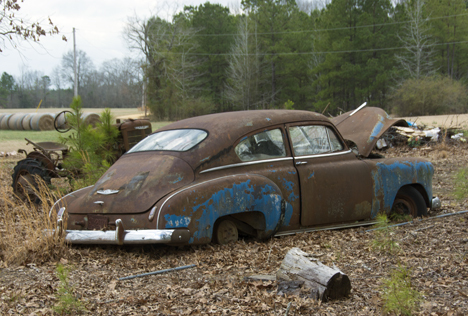 As you enter the property, the first display is a rusting 1950 Chevy Fleetline, sans wheels, but well decorated with fallen leaves. 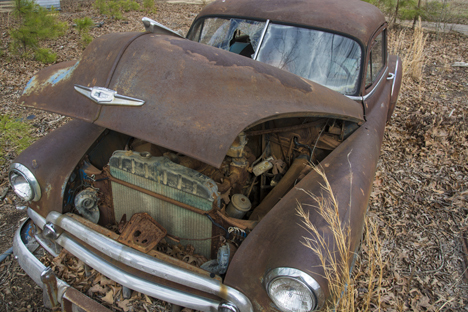 Most of the parts are still attached to the engine, the ubiquitous Chevy in-line six that would remain as the only power plant offered until 1955 when Chevrolet introduced its second V8. They introduced their first V8 in 1917, which was in 1917 and 1918 vehicles. Don’t ask me what happened to the first V8 because I do not have a clue. 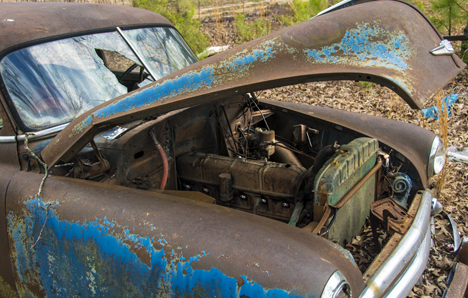 A patch or two of blue survives on this 1950 Chevy Fleetline. The old in-line overhead valve six remains relatively unscathed, and probably is fused into one homogeneous chunk of metal. There’s not much paint on this side which faces directly into the prevailing path of ill weather. The shape of the 1950 Chevy Fleet Line leaves no mystery as to how its name was contrived. 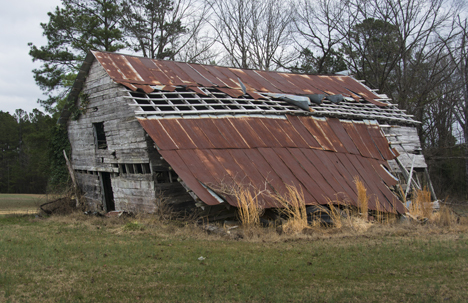 Not far from the old Chevy is the easterly leaning barn which has succumbed in part to the nasty weather which generally blows in from west/southwest. It is a sizable structure and at one time was someone’s pride and joy. Moving around the barn, the light improves and we get a better look at what Mother Nature and her close ally, gravity, have wreaked on the old structure. 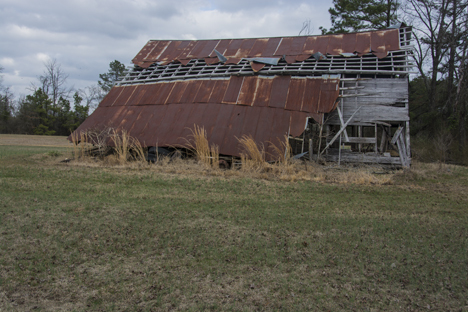 Continuing the walk-around, we see that the southwest corner has borne the brunt of that which will eventually spell the barn’s demise. 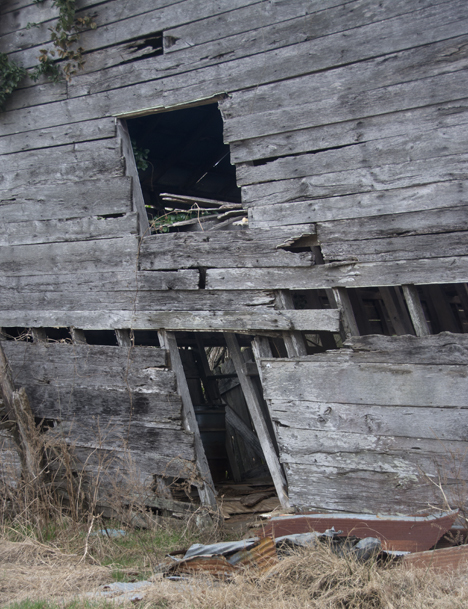 This is a closer look at the bludgeoned southwest corner of the barn. The walk-around ends at the front where we see how stress is popping boards loose. There is still “stuff” in the barn, but I doubt anyone would dare an attempt to retrieve it. When one considers all the photo ops on this location, and the fact that I have known about it for 14 years and am just now shooting it, you may want to question my sanity. But that would be nothing new. That question has been posed for years with no satisfactory answer. We got close on the Photo of the Week page. Time paints the most beautiful objects d’art.